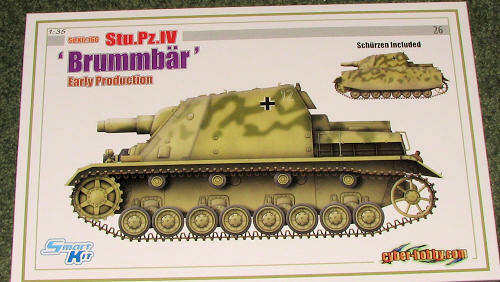 The original design of the Sturmpanzer IV (the subject of this kit) suffered from a series of flaws, which were gradually solved during the production process. The most important flaw was the high weight and recoil of the StuH 43 gun, which overloaded the Panzer IV chassis and made the entire vehicle top-heavy. Furthermore, early vehicles suffered from transmission failures and were underpowered. 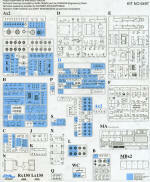 This is one of those 'how do they fit so many sprues into one box' sort of kits. This kit, as with many Dragon/Cyber Hobby kits is a combination of new slide mold parts and older standard molded bits, though that still means an exceptional kit for the money. As usual, the bottom and side of the box are full of what has been improved. this includes a new fighting compartment piece, new mantlet and gun mount, gun breech assembly, floor plates, rear ventilation guards, hull, engine deck, fenders, and the ever popular 'more'. Etched metal is used for the very nicely done and scale thick side skirt armor. Etched metal is also used for ventilation grilles and other bits. The fighting compartment hatches can be posed open if one desires and there are the highly regarded Magic Tracks system. Other features are a properly rifled gun barrel and a number of other smaller items that are appropriate for an early production vehicle. 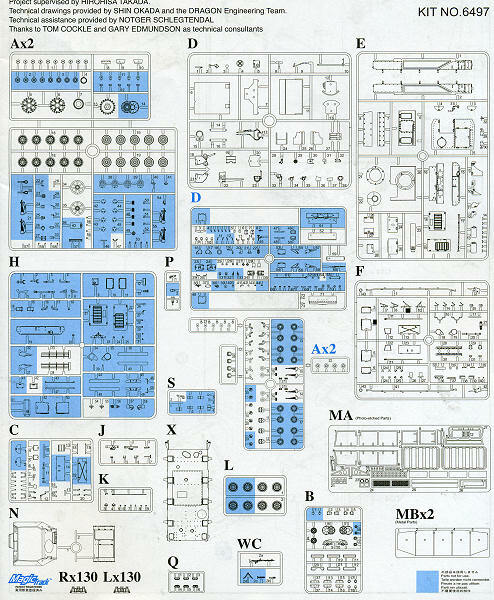 Though I could not find a listing of just how many parts this kit has (where do other sites come up with these figures), it would be easy enough to say 'hundreds' Of course, several of the sprues only provide a few parts, but there will be enough used to keep a modeler happy for many hours constructing this one. Markings are provided for three vehicles, all in a base of Panzer Yellow. First is from Stu.Pz.Abt 216 in 1943. Next, with the side skirts and a lot of green squiggles is from III./Pz.Jg Rgt 656 in 1943. The third options is also from Stu.Pz.Abt. 216 in 1943. This has green and brown squiggles with the side skirt mounts but no skirts. This vehicle has always been quite popular with German armor builders, with several always appearing at local contests. Now you have the ability to build an early production version, but you do need to grab it while you can as this is one of the 'white box' limited releases.